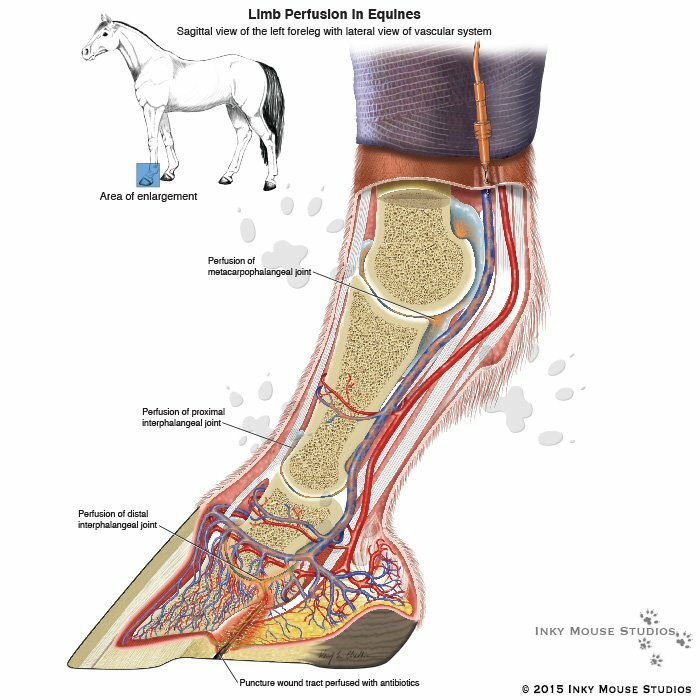 Equine limb perfusion is a procedure used to treat infections deep within the hoof or other structures of the distal limb. Infections of the distal limb in a horse can pose career ending, if not life threatening, complications if not treated in a timely manner. Systemic administration of antibiotic agents are often not successful because the level of agent in the tissues of the limb cannot reach therapeutic levels. Regional perfusion delivers a high local concentration of antibiotic right where it is needed, and confines it to the affected limb where it can permeate all the surrounding tissues with a therapeutic dose, providing a rapid eradication of the infection before it does permanent damage to delicate structures within the limb. The procedure is broken down into three steps and illustrated with associated key anatomical structures to explain how the procedure works. View Step 1 – which illustrates the problems puncture wounds can cause when they occur through the hoof capsule. View Step 2 – which illustrates how the limb is prepped for the perfusion procedure. You are viewing Step 3 – This illustration shows how the therapeutic dose permeates from the blood vessels into the surrounding tissues. This is a hybrid illustration combining the lateral view of the blood supply with a cross sectional view of the skeletal structure of the limb with tendons and ligaments. The focus of this illustration is to show the perfusion of antibiotics through the venous system and out into the surrounding tissues, including the joint spaces and the puncture wound tract.